You know you’re close when you see pillows of smoke drifting in the air. Smoke. So much smoke. Step out of the car to capture a photo from the hills above, and the smell of sulfur engulfs your nostrils. It both excites and scares me. Furnas, on the eastern side of the Azorean island of Sao Miguel, is a town of geysers spewing scorching steam into the air and bubbling-angry waters from the ground. Getting to Furnas from the island’s main city, Ponta Delgada, is half the pleasure. I used the north shore on the way to Furnas and the south shore on the return to the city. The drive took me through gob-smacking vistas, forests filled with scents of eucalyptus, land where pineapples grow and Europe’s only tea plantation is found. Focus. Hug the curb, I repeated in my head over and over, to stop myself from wandering off the road and plunging down some cliff. Beautiful as the sights were, I was passing through with no plans of making a permanent island stay. 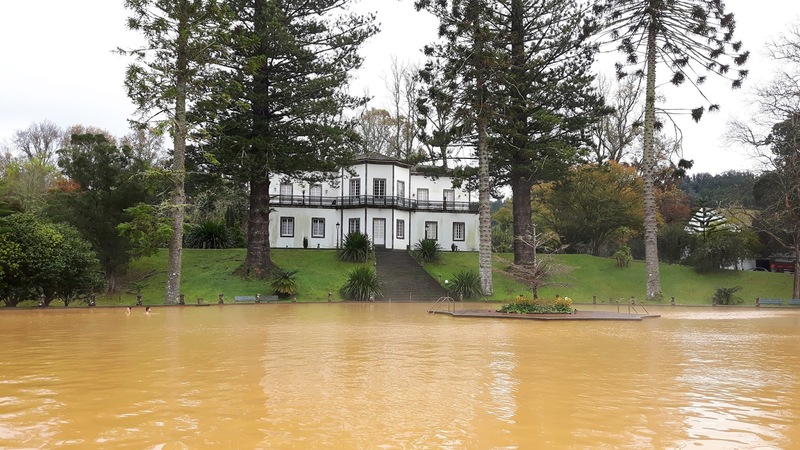 Furnas has long been a spa-town, thanks to the twenty-two different mineral waters found there and used in various spa treatments. It also has amazing bread and a dish meaty enough to have even the most carnivorous amongst us, consider a vegetarian lifestyle. 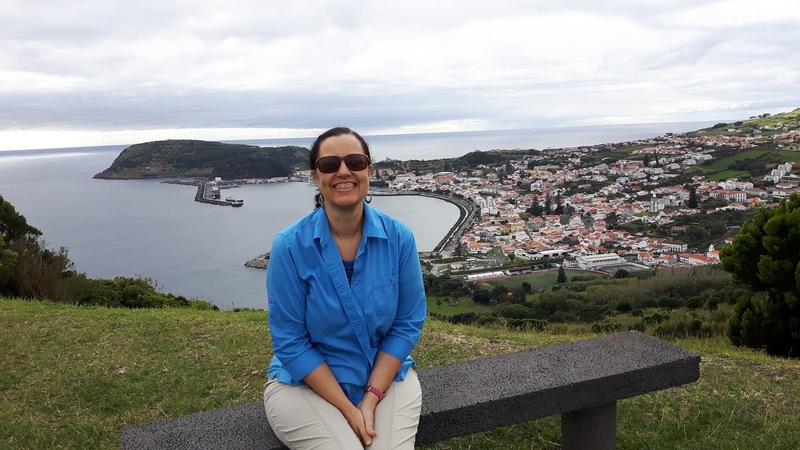 From Ponta Delgada, I set the GPS (something I highly recommend having especially if traveling solo) to the Terra Nostra Garden Hotel. The GPS took me to the gates of Terra Nostra Garden. Close. But not what I was looking for. I asked a local for directions. The hotel was just around the corner, down the first street, past the store with the vegetables on the left, next to the café on the right. “You can’t miss it,” I was told. It’s painted pink and bright-yellow. I didn’t miss it. 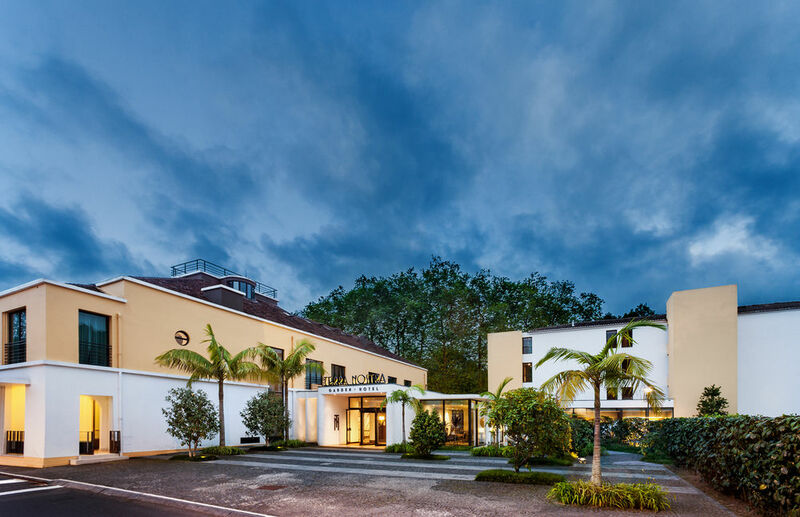 Terra Nostra Garden Hotel has direct access to Terra Nostra Garden, which is a nice little perk. There’s an admission fee to the garden with its famous thermal pool, but if you’re staying in the hotel, the fee is waived. It was drizzling the one morning I had set aside for my garden and pool visit. Since you can’t control the weather, I ventured off anyway. I took a lovely stroll around the park with its hundreds of plants imported from around the world including Australia, China, North America and South Africa. It’s a botanist’s dream! I got very close to the natural thermal pool, believed to cure everything from arthritis to skin disorders. I felt its heat, which ranges from 35 – 40 Celsius. I stepped back and examined its colour: rust, due to the high iron content. I sat on a bench and watched the gaiety between friends, who clearly were far braver than I. They were merrily splashing about and saying things like "oohh" and "aahh" and "das ist nett." I debated the merits of going in. It would do my skin wonders no doubt, but the effort of changing into a swimsuit to dip my body into what looked like a pool of mud, was not very appealing. As the annoying drizzle continued to fall on me, I came up with Plan B: Walk Away. I chose instead to enjoy the healing powers of a hot cup of tea from the comfort of a window-seat in the hotel’s restaurant. It felt quite Zen. And why not? Is there anything a good cup of tea can’t fix? As morning turned to afternoon, my stomach reminded me it was time to eat. 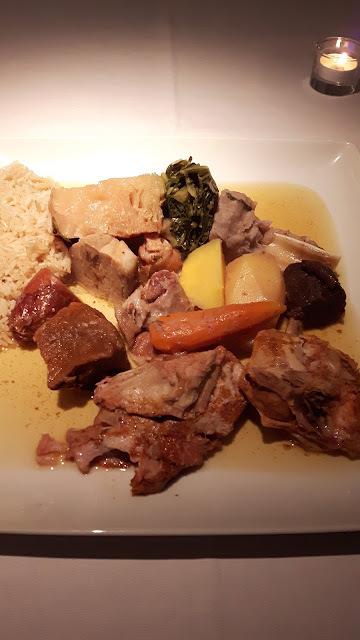 I ordered cozido, the local specialty, slow-cooked over many hours in holes dug around Lagoa das Furnas, a short trip outside town. Large metal-pots are filled with a variety of meats, sausages and vegetables. 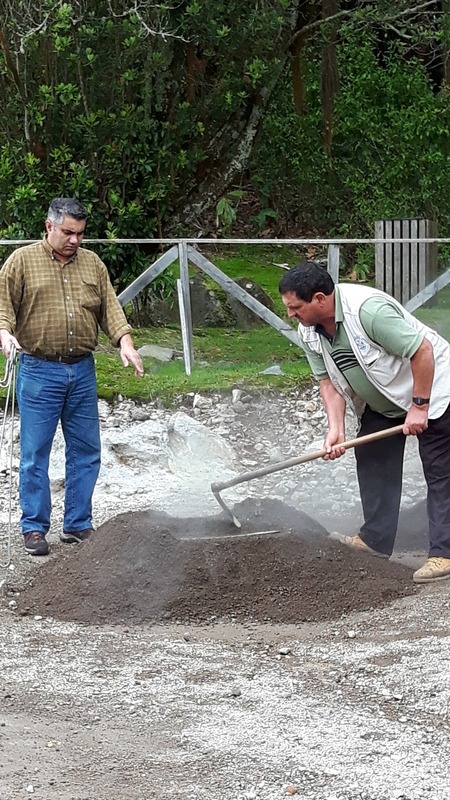 Then it's lowered deep into the thermal ground and allowed to cook five to seven hours. 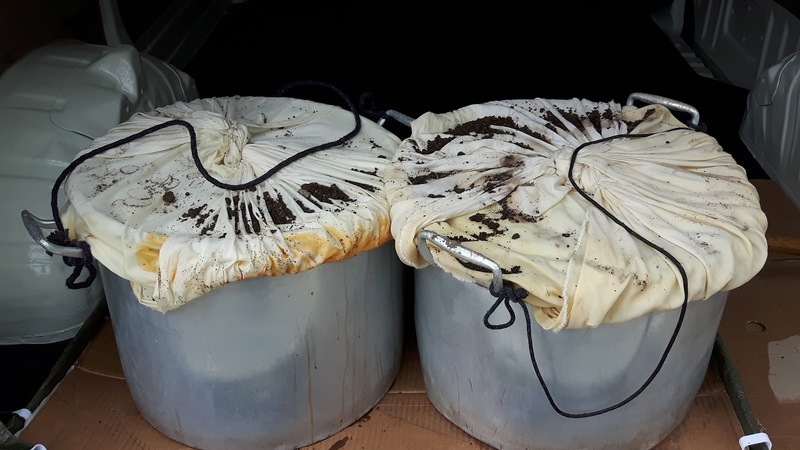 This method of cooking has been used for generations by island locals. 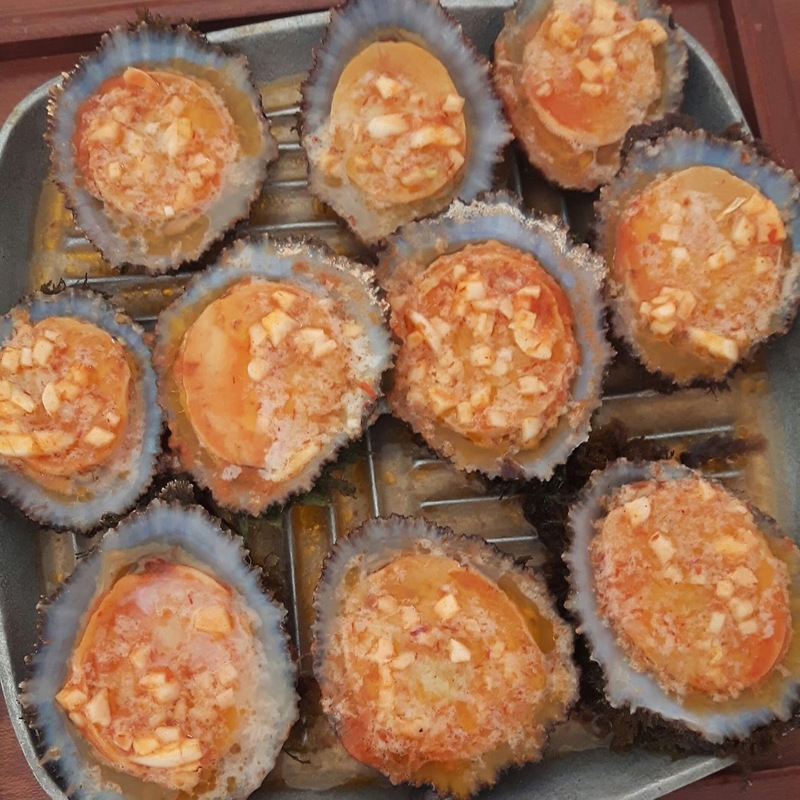 Today, this specialty can found in many restaurants in the Furnas area. I had to try it. My conclusion: It's a vegetarian’s nightmare! I was, in fact, vegetarian for the next 24-hours! 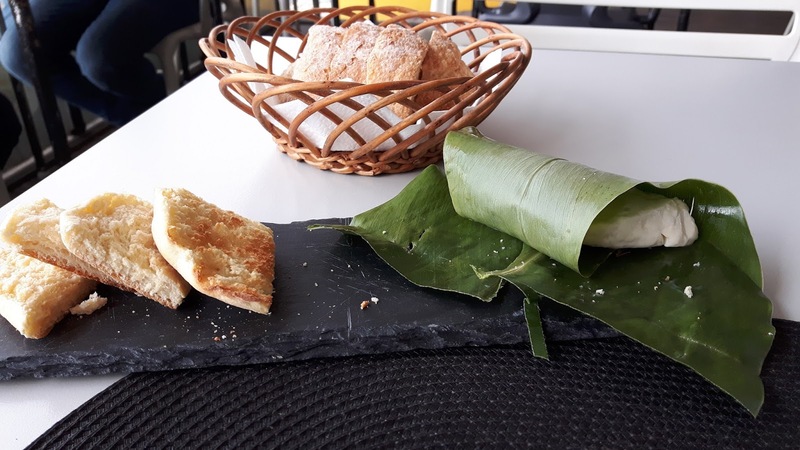 The best part of eating in Furnas though, is the local bread. 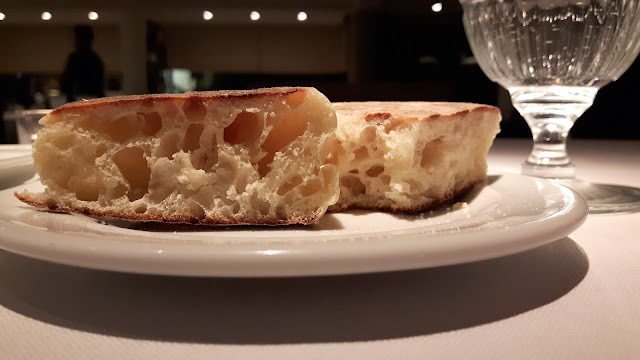 Called Bolo levedo, it looks very much like a large English muffin, but it tastes nothing like it. It’s a specialty of the Furnas valley not to be missed. Break into one of these darlings and find airy pockets just waiting to be filled with butter or jam or cheese. The outside has a slightly crunchy edge and a sweetness that makes you say, "more please." 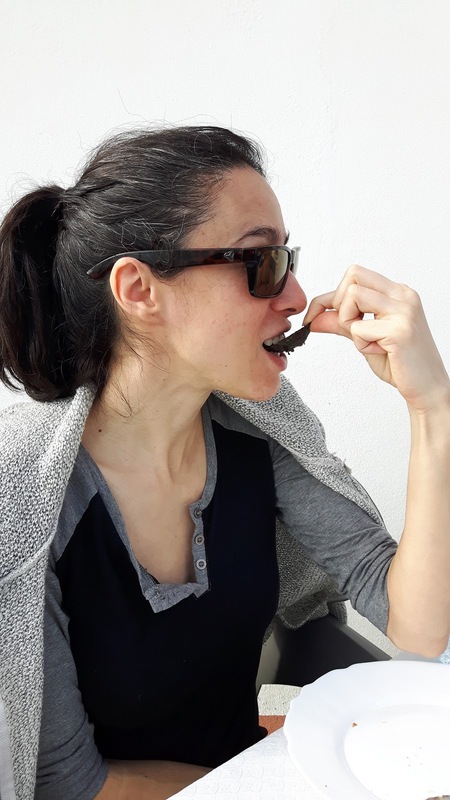 And on a drizzly-grey day, in a town where the earth seems to burst with anger, filling my heart with awe and slight fear, eating something as comforting as Bolo levedo with fresh Azorean cheese made me happy, happy, happy! Of course a glass filled with a robust local wine didn't hurt either. Verdade! If you haven’t already heard, let me tell you: Canada celebrates its 150th birthday this year. It’s a big deal for Canada, and it’s a really big deal for me -- 2017 marks the 50th anniversary of our little family’s arrival in Canada. It was 1967. Centennial Year. Expo ’67. It was February. It was cold. Bloody cold! We weren’t prepared for the cold. How could we have been? 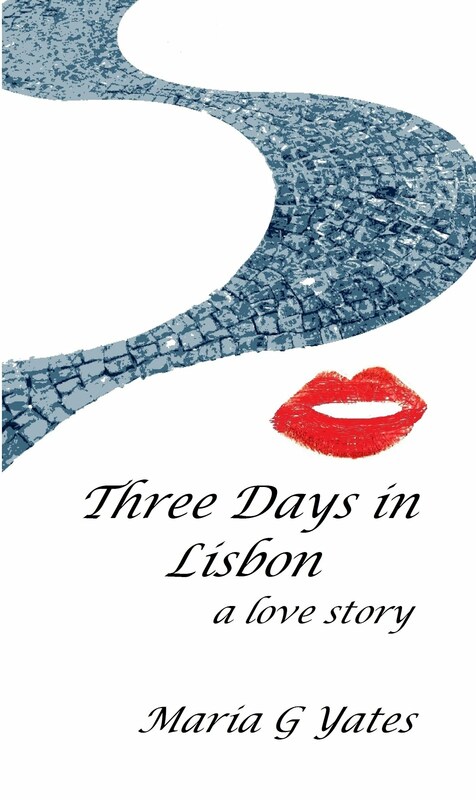 We were coming from the Azores where a cold day meant a head scarf and a thick sweater. We flew from the island of Santa Maria in the north Atlantic direct to Montreal, on the now defunct Canadian Pacific airline. It was my first plane trip and I was unbelievably excited. I was dressed for the occasion too. 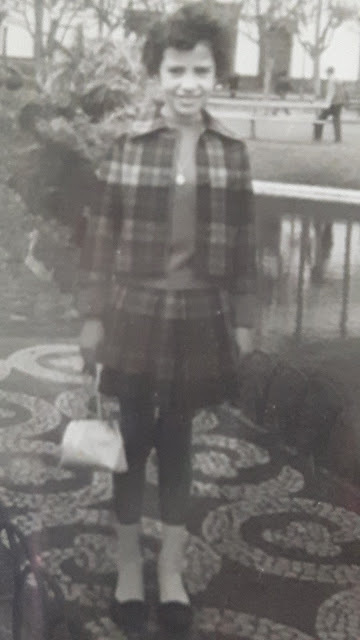 My Sunday best as it were -- black-patent shoes, white ankle socks, a tartan pleated skirt with matching jacket. It was an outfit right out of a Scottish dress shop, which was strange since we’d never been to Scotland. It was dark when we landed in Montreal and snow was falling. SNOW! I’d never seen snow. It was all so thrilling. I descended the airplane staircase feeling the bitter cold-wind whipping around my bare, scrawny legs. The ankle socks weren’t cutting it. Once I reached the ground, an airline employee quickly wrapped a blanket around me. That was my introduction to Canada. Cold. Dark. Snowy. Caring. Generous. I’ve loved it ever since. To celebrate Canada’s 150th birthday, and my own 50 years in this great land, I’m planning on heading somewhere yet to be discovered. By me that is. I’m happy to say I’ve (just about) travelled this country from coast to coast. I’ve seen icebergs in Newfoundland; whales in Quebec; totem poles in British Columbia. I’ve walked icefields in Alberta; swam in the chilly waters of Georgian Bay (Ontario); jigged for cod in Nova Scotia. I’ve eaten scallops in New Brunswick; lobster in Prince Edward Island; buffalo burgers in Manitoba. The adventures I’ve had across this vast country are too great to summarize in one paragraph. Still, there are more out there. I’ve not been to: Saskatchewan, which puts it high on my list of possible journeys this year. I’ve also not been to Canada’s north. I want to experience the mid-night sun and the aurora borealis (norther lights). Canada’s arctic is definitely on the list. Decisions, decisions. Meanwhile, Ottawa is Canada-150 Party Central. There is so much happening in Canada's capital this year, it really should be on everyone's travel plans. To get you started, here is a quick roundup of what is happening in the various museums around the city. 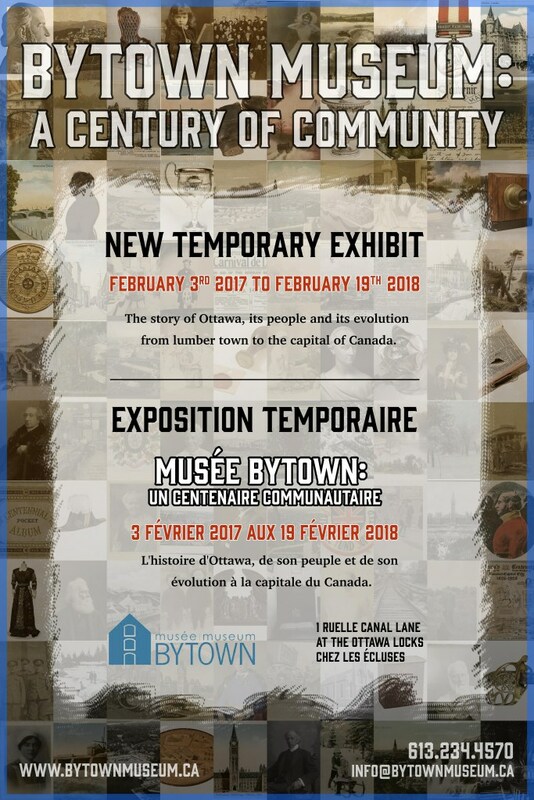 The Bytown Museum celebrates its 100th anniversary by showcasing objects from its permanent collection in A Century of Community. It runs until February 19, 2018. At the Diefenbunker:Canada's Cold War Museum, Canadian artist Valerie Noftle's exhibition From the Hand, exploring the stories of veterans through photographs of their hands, runs until July 30, 2017. 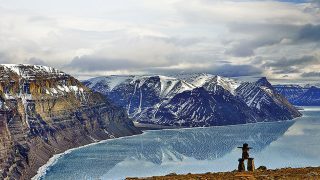 On June 21, 2017, a new permanent Canada Goose Arctic Gallery opens at the Canadian Museum of Nature, focusing on the ecology of one of the world's harshest climates. 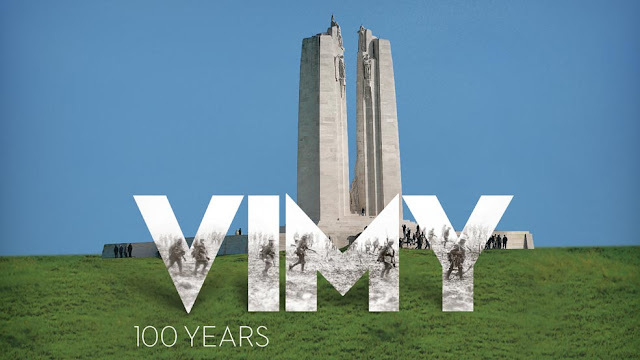 At the Canadian War Museum, the 100th anniversary of the pivotal Battle of Vimy Ridge is commemorated between April 6 and November 12, 2017 with the exhibition Vimy - 100 Years. 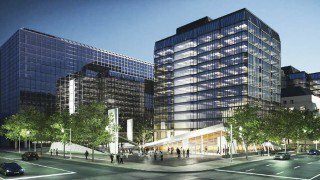 The Canadian Museum of History opens its new Canadian History Hall, on July 1, 2017. It tells the story of Canada through 18 "chapters" of artifacts in three galleries. 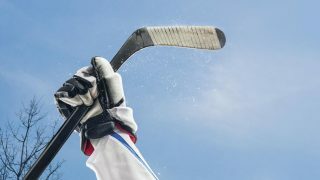 Until then, catch Hockey, until October 9, 2017, which explores Canada's historic love of the sport of hockey and its impact on Canadian identity. At the National Gallery of Canada, a number of exhibitions are happening including, Photography in Canada: 1960-2000 (April 7-September 17); PhotoLab 2: Women Speaking Art (April 7-October 1, 2017) and Canadian and Indigenous Art: 1968 to Present (May 3, 2017-May 6, 2018). This all leads up to the unveiling of the new renovated and integrated Canadian and Indigenous Galleries on June 15, 2017. And finally, watch for the reopening of the Bank of Canada Museum (formerly the Currency Museum of the Bank of Canada), this summer and the completely renovated Canada Science and Technology Museum in November 2017. Canada's National Museums Passport has been revamped and now offers admission to 3 national museums, over 3 consecutive days. It costs $35. Each accompanying child (17 and under) receives a 30% discount on general admission. The passport is available at the six national museums that participate in the program, as well as at the Capital Information Kiosk across from Parliament Hill. You can find full details here. Whoa! All this and so much more. When Is Too Much Of A Good Thing, Bad? It began the way any obsession does – with a single occurrence. Our rental car awaited us, and towing carry-on luggage only, we were out of there in quick order. No time to waste. I had, more-or-less, planned our route. 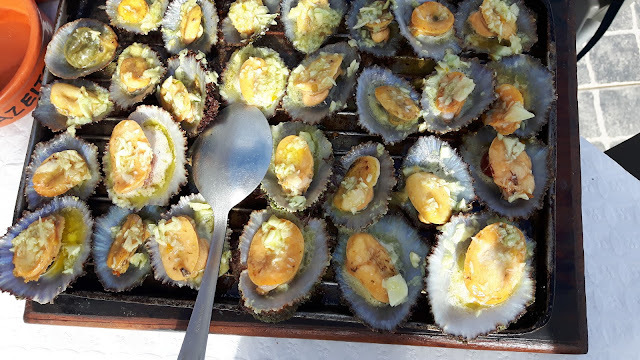 We would drive the north coast of the island to the town of Furnas for breakfast. Then motor to the opposite side of the island to Sete Cidades (Seven Cities) for a late lunch. In between, we’d stop at this lookout and that lookout to gawk at the landscape and when the need arose, have the obligatory bica (espresso) wherever we found ourselves. From the miradoure (lookout point) high above the town, we posed for pictures with the lakes behind us. Then we crossed the street to explore the abandoned hotel, with its graffiti laced walls and tree-lined balconies. Then we all agreed: we were starving. Time for lunch. 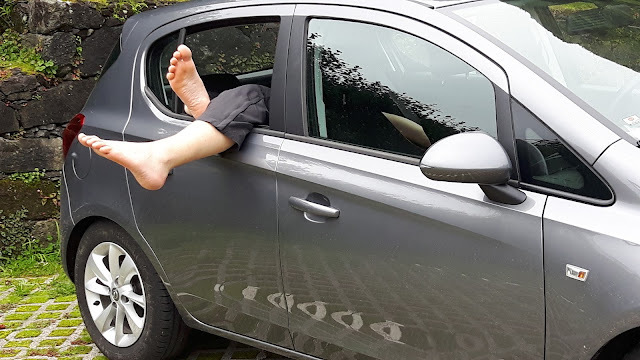 Tightly hugging the curb, Andy drove our little vehicle down the escarpment and over the bridge with green lake-water running underneath it, leading to the town of Sete Cidades. He parked. We greeted the cow lazing on the field to our right, and made our way to the first restaurant we spotted. With its large patio, green-plastic tables and white chairs, it was perfect. A quick review of the menu posted behind a small glass window confirm it. Andy has been part of our family for a number of years and has become familiar with many of our traditional family foods. 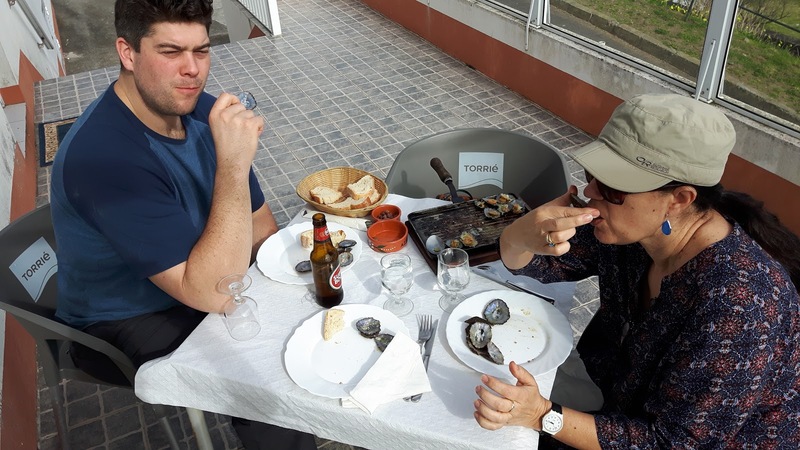 Early on he was introduced to stewed octopus, salted cod, morecela (blood sausage), sapatel (blood pudding), to name just a few things. He was more than ready for a food adventure on this trip. “Lapas. I've heard you guys mention this. I have to try them.” he said. 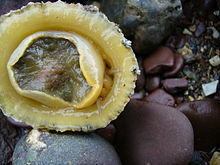 Lapas are limpets, defined by Wikipedia as: an aquatic snail shell that is broadly conical in shape. To the Azorean people, lapas are a gastronomical feast, a delicacy appreciated only by those who are comfortable popping into their mouths organisms that are wriggling, with antennas whizzing about. People have lost their lives scraping lapas off rocks buried deep in the pounding surf. Lucky for us we didn’t have to risk our lives, neither did we have to face a live lapa. The menu offered up ‘grilled lapas’. Excellent, I thought. We ordered. They arrived at our table sizzling on a hot grill. Like a steak or fajitas, but a far stretch from anything served in a Toronto area restaurant. The scent of garlic hit my nose with a wallop, which, to be very clear, is not a complaint. Careful not to brand our fingers on the hot grill, we carefully retrieved one shell at a time, popped it into our mouth and began with moans usually reserved for experiences outside the kitchen table. Things like, wow, and oh my god, that is soooo good, were stated. And so we did. For the next seven days. Be day two, we began judging -- on presentation, texture, amount of garlic, were they served with lemon wedges or not? Was the taste enhanced if the lemon was squeezed over them? By day 3 we knew what ‘over-grilled’ was (rubber-chewy is never good). 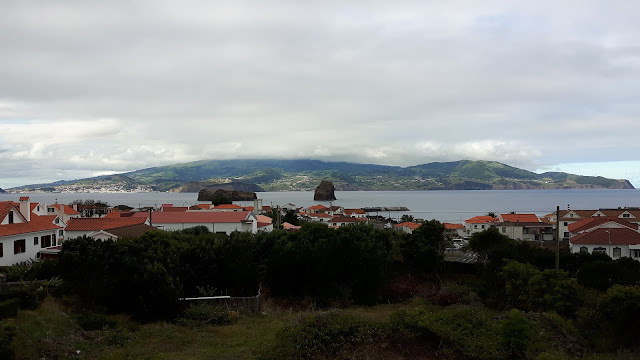 Then day 6, our final day in the Azores, arrived. New day. New restaurant. Andy had stepped away to the WC but not before reviewing the menu. She gave me a glare that screamed: You started this! Our server arrived. We placed our order. “Did you order the lapas?” asked Andy taking his seat across from me. “Sure did,” I answered. I had started this. Our trip eventually led us to Lisbon. “Huh! No lapas,” said Andy on our first night out in a Lisbon restaurant. “No. They’re not consumed here.” I said. And secretly praised the Food Gods. 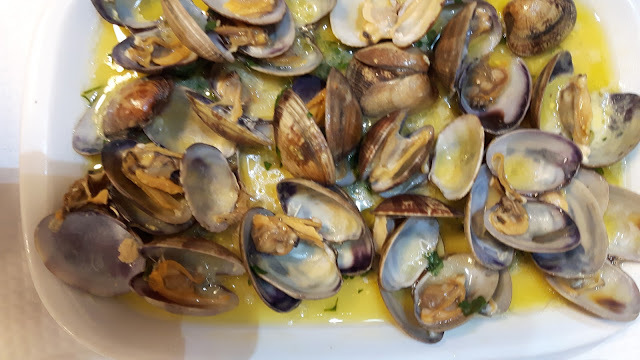 Andy settled for clams swimming in garlic, olive oil and cilantro. I took one, commented to its flavour, (it was delicious) but remained silent after that. Let’s not start this again, I thought! It’s a story I’ve been told many times. It’s short and never changes. Ever. That was my father’s recollection and connection, to the submarine volcanic explosion off the western coast of the Azorean island, Faial, in the fall of 1957. He was in Graciosa, 147 km. away, but with a clear view of the island directly across the channel, the smoke filling the sky was easily seen. 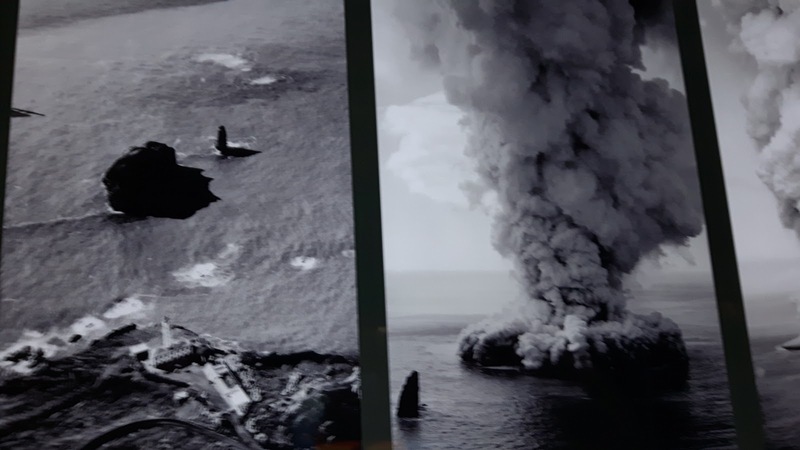 The eruption and tremors lasted 13 months (September, 1957 to October, 1958), displaced 2000 people, buried 300 homes and a lighthouse, and added 2.4 kms to the island’s land mass, most of which has been reclaimed by the ocean. 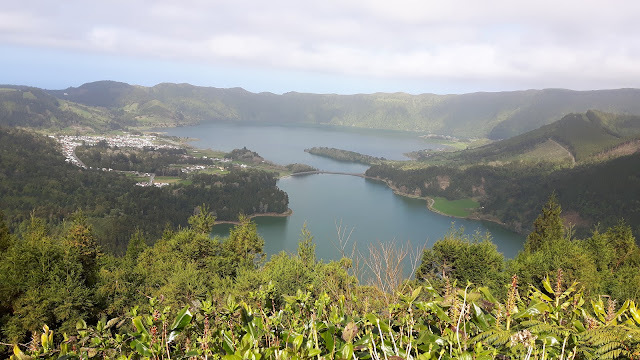 On my recent trip to the Azores visiting this area was a must. 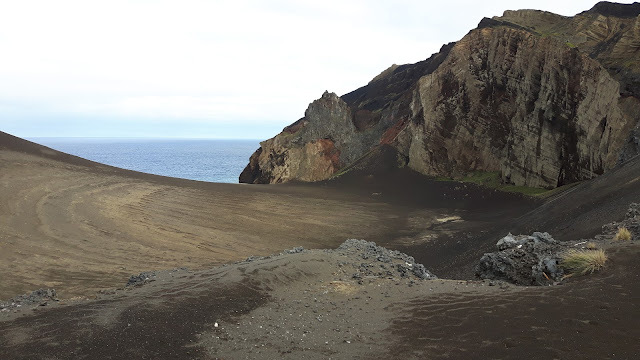 Faial, is a short 30-minute ferry ride from its neighbouring island, Pico, where I was staying. Helena, stocky, red-headed and chatty, was the tour guide and cab driver I had arranged to meet on the pier. She was happy to show me her island. 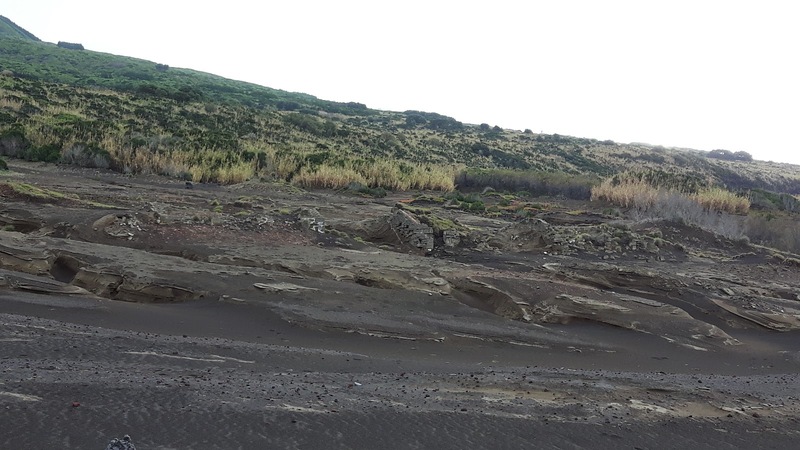 Together we drove through the lushness of the Natural Park of Faial, a protected area that comprises 17% of the island's total land mass. 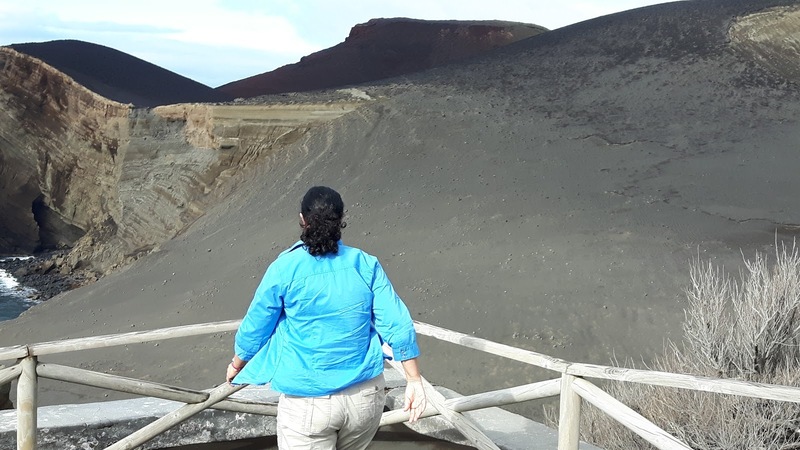 Helena took me farther, deeper, higher towards the caldera, a symbol of the island’s volcanic beginning. A shroud of fog surrounded us. Still, the flora and fauna of the area could be observed, including Laurel trees as tall as 60 feet. 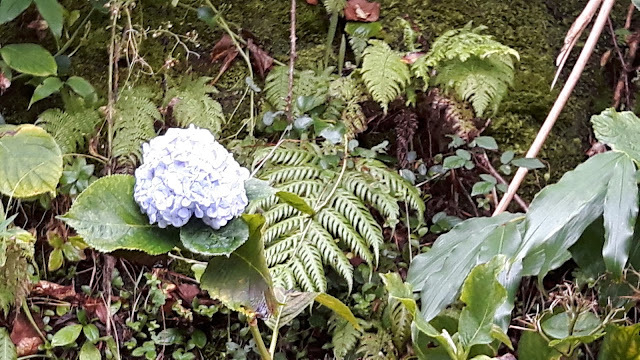 Thick-green bushes of blue hydrangeas lined both sides of the road. Unseen birds chirped. 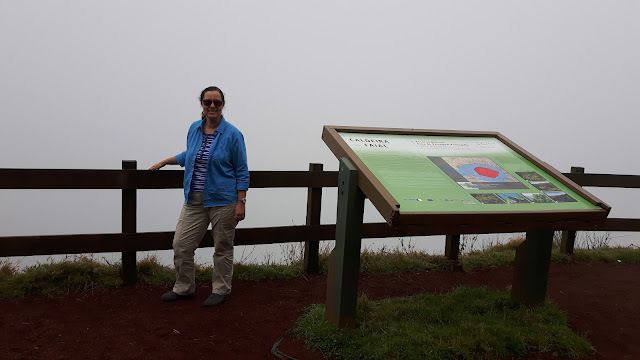 The fog and mist, which are common in the Laurisilva forest we drove through, added to the mystique. The sights and sounds of Faial filled my senses – hues of green, yellow and blue; soothing sounds of waterfalls, birds and the Atlantic Ocean. 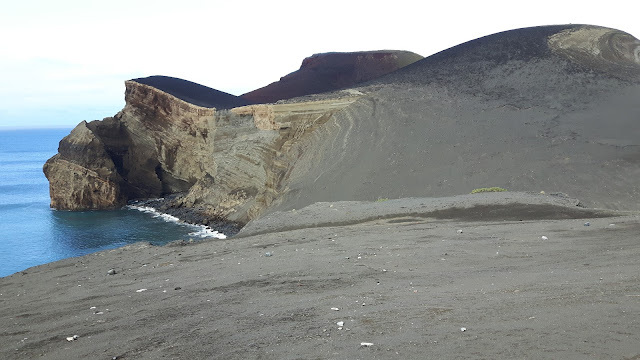 The last stop on my island tour was Capelinhos, the site of the volcanic eruption, so entrenched in my father's memory. “There is it,” said Helena. She nodded in the direction. “Oh wow,” I said, somewhat shocked. It was a stark contrast to all I had been observing just minutes earlier. A large mass of grey and black lay ahead of me. The azure of the sea was right there. Surrounding it. But it was insignificant to the blackness of the earth we were driving on to. Once parked, I stepped outside the car to experience a profane silence that was simply unnerving. The ocean was still pounding its surf. 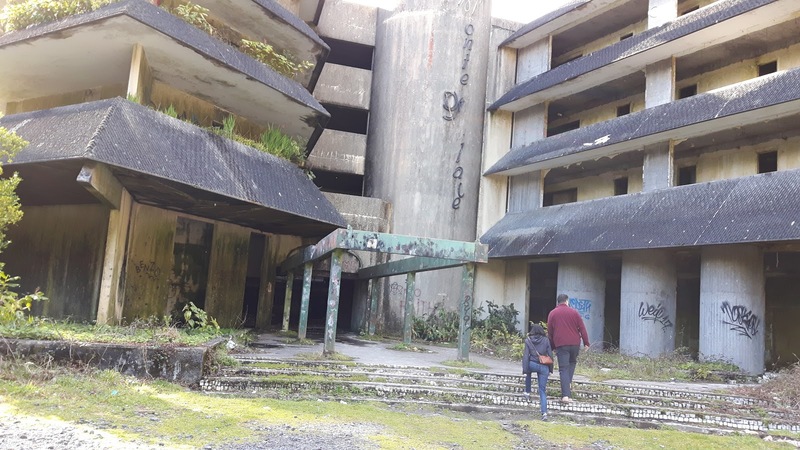 In all practicality, I’m sure it sounded the same as it did in the other parts of the island I had visited, but here, in this place of darkness, it all just ‘sounded’ eerie. I took a deep breath and slowly spun around, trying to take it all in, but it’s just too big. Too large to absorb. “This way,” said Helena. 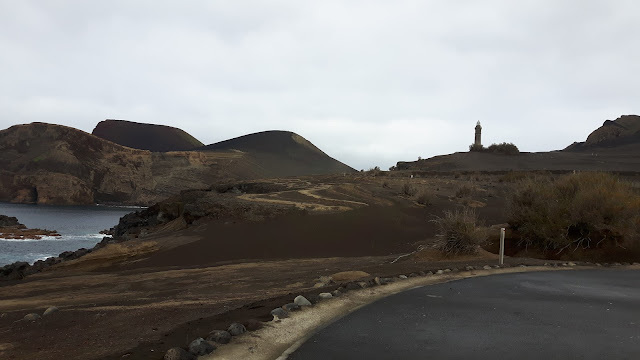 We walked down the long stone-path leading to the underground interpretation centre, with its various exhibition halls and an auditorium showing 3D movies about the formation of the islands: the ocean churning in fury, fire exploding from the sea. It was during the screening, that I it hit me: OMG, this could happen again. Here. Now! Coming from a part of the world where the worst natural disaster I’ve experienced has been an ice storm with its resulting 12-hour power outage, I felt a shiver of terror come over me. Traces of my claustrophobia kicked in, no doubt. I wanted to leave, to at least be outdoors and not underground in a place that was already covered in volcanic ash. Once the film was over I was out of there. 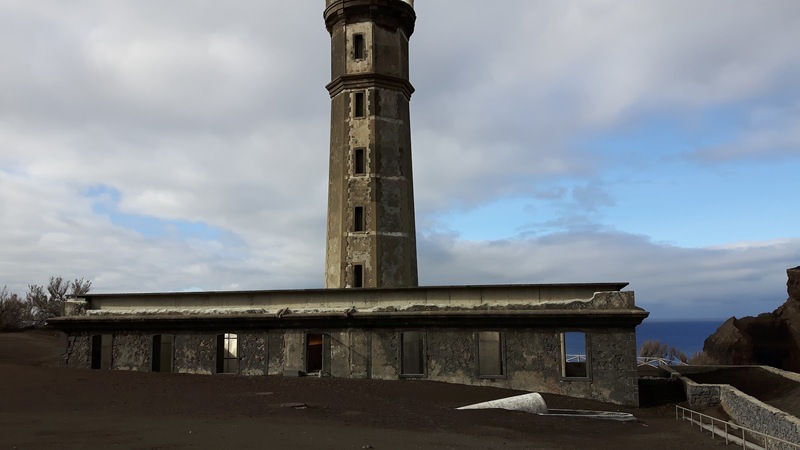 Back outside, I wandered through the lighthouse which was mostly buried after the eruption, but has since then been excavated to its present state. The admission fee (10 Euros), provides access to the top of the lighthouse, with its spectacular views over the area. I passed on this option and chose instead to meandered around. It is a dark, silent, chilling landscape. I looked across the sea, towards the island of Graciosa. 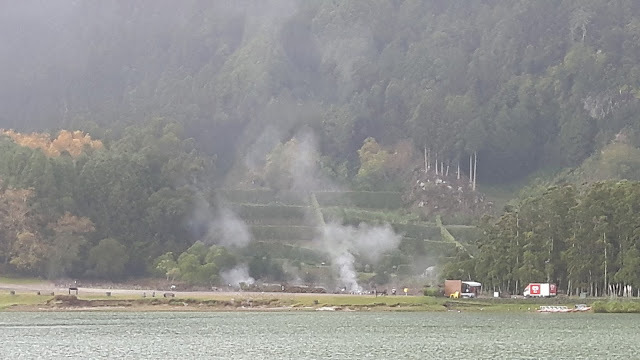 I tried to imagine what my father must have felt the day he walked home, seeing the smoke-filled sky on the other side of the water, unaware of what waited him. It was all too horrible to imagine. I’m not sure why. exactly, I was driven to make a pilgrimage to this place. I just knew I had to come. And I'm glad I did. Somehow being there, seeing the darkness and absorbing the silence, made me feel closer to my father, his story and to the brother I never knew. 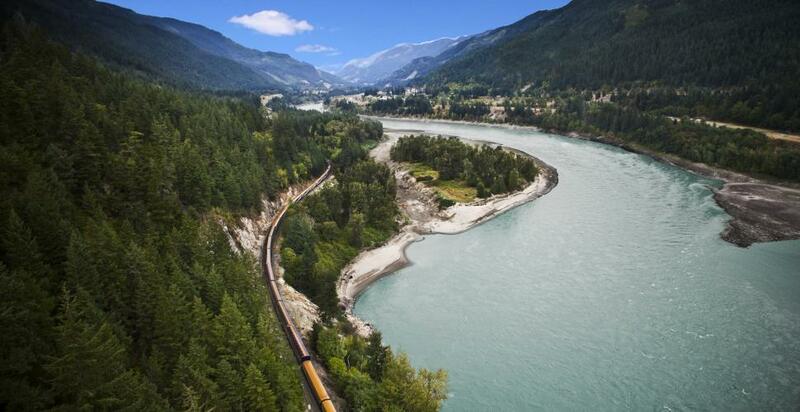 Following up on the first part of my luxe train voyages list, this is the second (and final) instalment of my top picks for train trips around the world. The list is in no particular order--simply journeys added to my bucket list. Considered to be one of the most luxurious trains in the world, Pride of Africa takes guests between Cape Town, South Africa and Cairo, Egypt with magnificent journeys to the east and to the west also available. 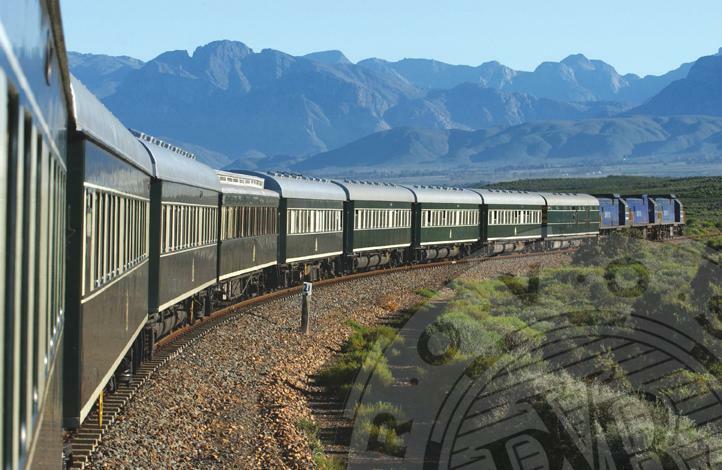 Pride of Africa combines the golden age of rail travel with modern amenities. Suites are ultra-deluxe, decorated in Edwardian period features. A well-stocked mini-bar is available, as is 24-hour room service. Lunch and dinner are multi-course affairs served on lovely china, silver and crisp linens. Fresh local ingredients and traditional dishes are on the menu. All meals are served in one one of two Victorian-era restaurant cars. 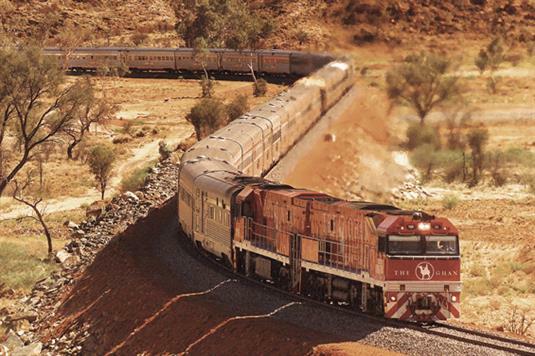 Named for the Afghan cameleers who once traveled this route, The Ghan has been traversing Australia for more than 80 years, taking guests from Adelaide to Darwin, in comfort and luxury. Large panoramic windows provide optimum viewing of the ever-changing Australian landscape. In the restaurant car, onboard chefs prepare menus that feature Australian and International cuisine. 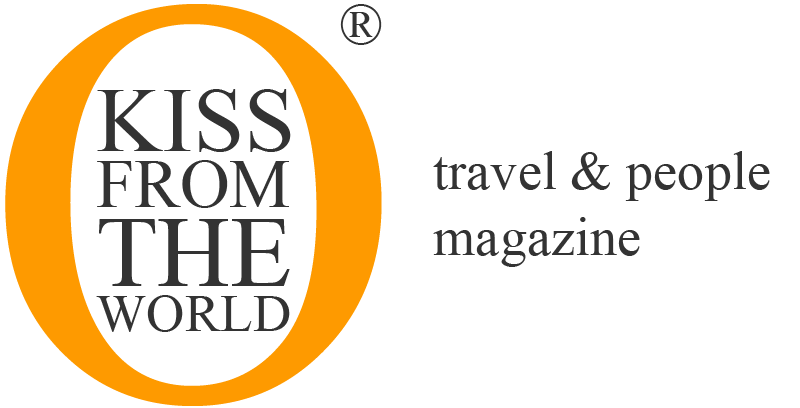 Headquartered in Budapest, Hungary, all itineraries through central Europe either start or go through Budapest. The Danube Express serves only 50 passengers in a combination of modern conveniences and traditional style. Deluxe sleeping carriages offer private compartments with en-suite washrooms, and two lower beds that fold up into seating during the day. There are windows that open throughout the train for maximum views. 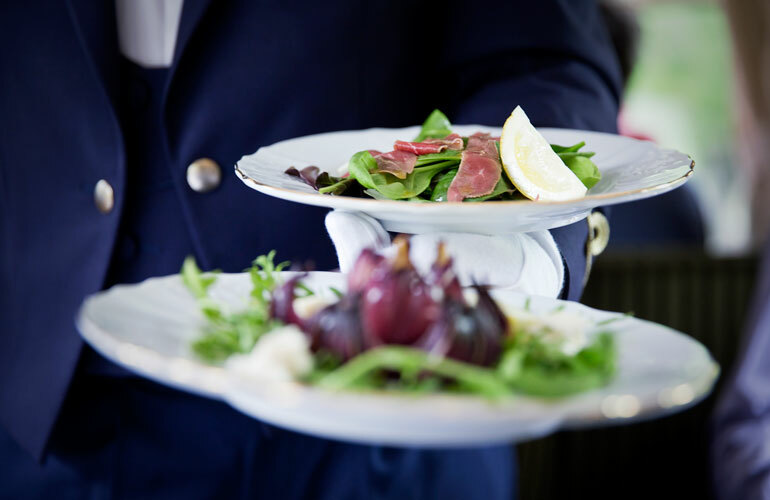 All meals are freshly cooked onboard by experienced chefs using local and seasonal ingredients. Need to see Siberia? This is the way to do it. 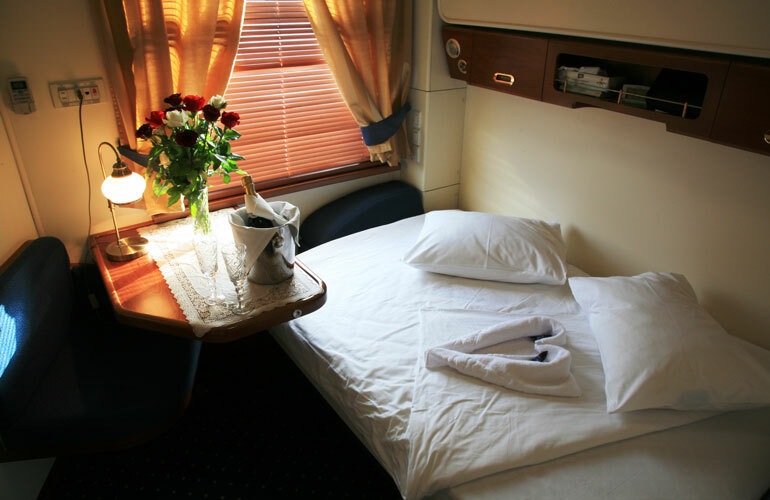 Launched in Moscow in 2007, the Golden Eagle Trans-Siberian is an all-suite luxury train. Its route is the famous Trans-Siberian between Moscow and Vladivostok. Covering 9,258km (6,152 miles) and taking seven days, it is the biggest train ride in the world. For luxury travelers, two Imperial suites were added in 2012, providing 120 square feet of space, a fixed king-sized bed, en-suite shower, a dedicated dressing table and lounge area. Dining takes place in one of two restaurant cars offering a central buffet. 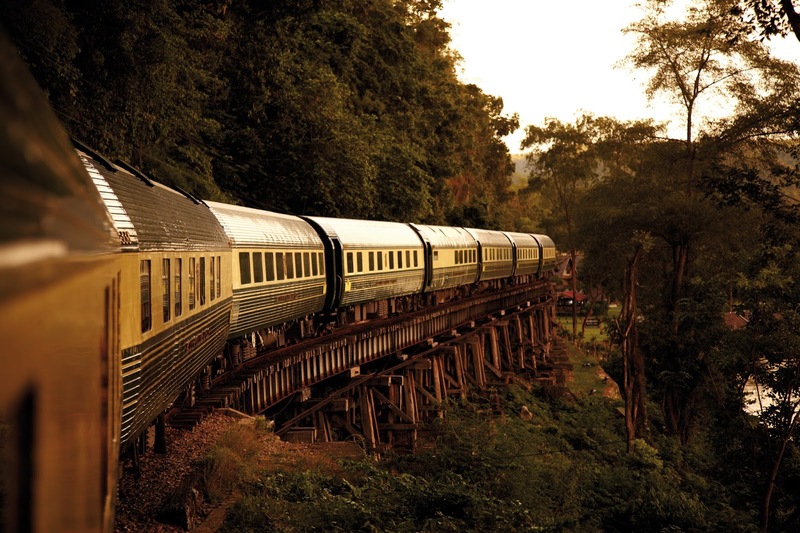 This train runs 1,262 miles between Singapore, Malaysia and Bangkok and is one of the most beautiful in the world, conjuring up images of a bygone era filled with glamour and opulence. Dining on board this train is a highlight. Its French chef has developed dishes that have received international accolades for blending Western and Eastern culinary styles. Breakfast is served in your compartment, while high tea can be enjoyed wherever you prefer. Which rail do you want to ride? The start of a new year gives way to reflecting on the old, and frankly, I had a hell of a year! 2016 was a year of many "firsts" for me, including, taking the car in for service, attending a theatre production alone and cooking for one. In late 2015 my life took a turn. I became a widow, a title I despise by the way, mostly because of the reaction I receive -- mostly from customer service personnel. This is usually followed by a stare from someone whose face goes from smiley to frown, faster than a Chevy at an Indy car race. It’s a look that says to me, this wasn’t covered in my customer service training. 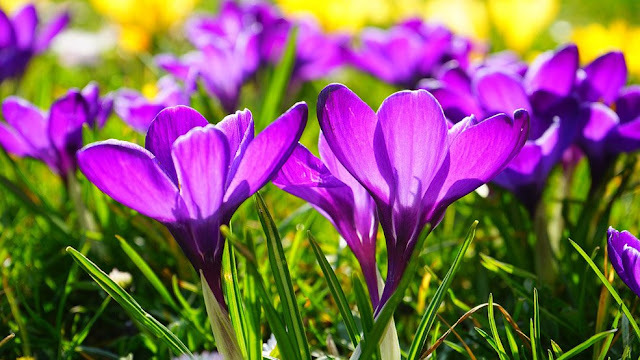 So just how did I manage my first year of widowhood? Frankly, a lot of it is a blur right now. One day blended into the next, until 365 days had passed and presto, before I realized it, a whole year was done. I do recall travelling in 2016, each trip a step forward in my personal grief journey. My husband, David, was an avid traveler. Prior to our meeting he had already covered a great deal of the world. I, on the other hand, had barely driven out of the Greater Toronto Area. When we were raising children, our trips remained close to home. Once our children were gone, we ventured out. I had some catching up to do, after all. With my travel companion gone, the question became: do I stop travelling because I no longer have a partner to travel with, or do I go on my own? The answer was pretty clear to me. Off I went. I booked myself on the sister-ship to the last one David and I had sailed on. Still, I felt a cruise was a ‘safe’ option for a first trip. I knew what to expect. There would be no language barriers, all meals would be taken care of, I was familiar with the lay of the ship. Did I have a great time? Contrary to what the photos might suggest, no. I had a miserable time, spent mostly in my inside cabin, which was smaller than today's modern walk-in closets. But the single-supplement (another first) was 100% and I wasn't prepared to pay the amount required for anything grander than a closet. At the end of my 7-day Caribbean cruise, the only thing I returned home with was the satisfaction I had done it. I had pulled up my big-girl pants and taken my first trip since widowhood was bestowed upon me. All on my own. That may not sound like a big deal to many, but to me, it was an accomplishment. In May, I set off to Halifax, Nova Scotia to visit my friend, Elaine, who herself had become a widow two years earlier. Together we shared old memories, laughed and cried. But that’s how it is with us widows, laughter and tears are intermingled and flow easily from one to the other. Life moves on and you either shut the door on it, or choose to live it. Elaine and I choose the latter. We visited museums, set off on coastal drives, visited old friends and made new memories. That’s the joy of living. In August, I was off to Granada with another girlfriend. I stress the girlfriend bit, because she is a friend who happens to be a girl, and because we stayed at Sandals Resorts. If you know anything about Sandals, you’ll know it’s a ‘couples only’ resort and we’re not that sort of ‘couple’ (not that there’s anything wrong with it). Ingrid and I had great fun going along with the assumptions made when two women are seen clinking glasses during dinner, entering the king-size-bed-furnished room, or merely strolling along the beach together. On yet another evening, as we walked through pathways lined with flickering candles and gently swaying palm trees (very romantic), I was complaining about how the photographer in the dining room had taken a photo of every couple, except us. “But we don’t care to have photos taken,” said Ingrid. “Yes, but I want to be asked,” I said. As we continued this banter, another photographer, who perhaps had overheard our comments, crossed our path. “Would you like your photo taken?” she asked. “Yes,” we answered in unison. We didn’t buy any of the photos, so I can’t show you the grin on our faces as we posed for the lens with arms wrapped around each other, like the amorous couple we are not. My final trip of 2016 came in November when I visited the Azores, nine Portuguese autonomous islands in the north Atlantic. I spent three weeks exploring, meeting new people, eating and reflecting. 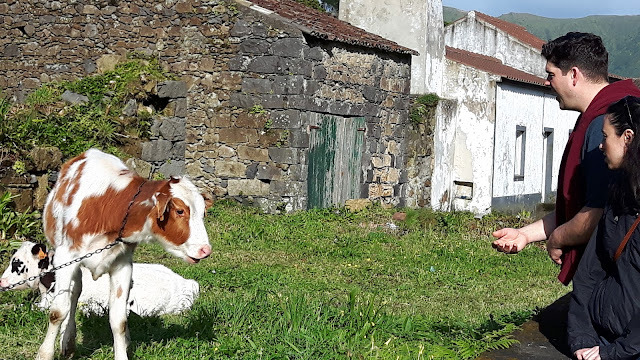 My first week was spent in Graciosa, the second smallest island in the chain and the island I was born in. I stayed with an aunt and uncle who live in Toronto but return every year. Together we drove multiple times around the island (it’s really small), taking in the pounding surf, the green hills and pastures dotted with herds of cows. The last two weeks of my Azorean adventure were spent on my own, flying and taking ferries between five other islands. I rented a car in each island, planned a route and hit the road. Along the way I met some wonderful people, took in breathtaking landscapes, ate foods I can't get in Canada. I engaged in conversation often, with as many people as I could have, yet it was not enough to shake the loneliness I often felt. Still, the experience did not deter me from dreaming of future trips. There are many reasons I chose to travel in 2016. I travelled for the love of it and I travelled for the healing I was, and continue to seek. Grief is, afterall, a journey of sorts. And travel through it, I must. Wow, that must have been fun. Really? I wish I could travel like you. Really? But the one comment that stands out the most is this one: You’re so brave. I could never travel alone. To that one I ask: what’s my option? Not to travel? That is not an option for me. So I welcome 2017 with an open heart and optimism for a future filled with warm memories, laughter, love, and lots more travel.